Who is the All Time Greatest Female Athlete? Most lists of the greatest athletes of all time tend to be dominated by male athletes, though there have been many female athletes who have excelled in their sport and had a significant impact on their sport. There have been several lists of great females athletes, and any reliable list should have Babe Didrickson Zaharias and Lottie Dod at or near the top. These two were once named by the Guinness Book of Records as the world's most versatile female competitors. Athlete Jackie Joyner-Kersee is also found at the top of these lists, and may be the greatest modern greatest female athlete. Here are some details of top female athlete lists that have been published. Sports Illustrated list of the Top 118 Female Athletes - published in 2000, top of this list is Jackie Joyner-Kersee and Babe Didrikson Zaharias. ESPN list of the top 40 female athletes of the past 40 years from June 2012 had US Soccer player Mia Hamm leading from Martina Navratilova then Jackie Joyner-Kersee. Bleacher Report list of the Top 50 female athletes ever, with Jackie Joyner-Kersee top followed by mulit-sport athlete Babe Didrikson Zaharias. 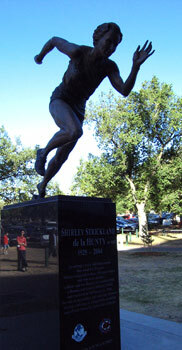 The ESPN SportsCentury program in 1999 created a list of the Top 100 Athletes of the 20th Century (which was limited to North American athletes), which included eight females; Babe Zaharias (ranked 10th), Martina Navratilova, Jackie Joyner-Kersee, Wilma Rudolph, Chris Evert, Billie Jean King, Althea Gibson, Bonnie Blair. Here is a list of some of the top 'greatest female athletes' the world has ever seen, sourced from the above lists and others. If you have someone else to suggest, let me know by commenting below. Lottie Dod tennis, hockey, archery, golf UK At age 15, she became the youngest woman ever to win the Wimbledon Ladies' Singles Championship, and went on to win it 4 more times. Played field hockey for England national two years after taking up the sport. She won the British Ladies' Amateur golf tournament in 1904. Won the silver medal in archery at the 1908 Olympics in London. Jackie Joyner-Kersee track & field USA 4-time Olympian and 6-time Olympic medalist who twice won gold in the Heptathlon. Sports Illustrated voted her the greatest female athlete of the 20th century. Fanny Blankers-Koen track & field The Netherlands sprinter and hurdler who won 4 gold medals in the 1948 London Olympics. In the post-war years she set or equalled 12 world records in events as diverse as the long jump, the high jump, sprint and hurdling events and the Pentathlon. In 1999 the IAAF voted her the greatest female athlete of the 20th century. Martina Navratilova tennis Czech / USA player with the best winning record (man or woman) in tennis history. Billie Jean King tennis USA Won 12 Grand Slam singles titles, with a career Grand Slam. Oldest woman to win a singles tournament at age 39. Famously won a "Battle of the Sexes" match, against Bobby Riggs in straight sets in 1973. Wilma Rudolph Track & Field In the 1960 Summer Olympics in Rome Rudolph became the first American woman to win three gold medals in track and field during a single Olympic Games.